System-generated events record changes to data within the AffiniPay Payment Gateway. You can retrieve events so your application or business system can respond accordingly when system changes occur. You can retrieve information about AffiniPay Payment Gateway events that focus on the status of transactions and recurring charges on a merchant account. See Event Handling for a list of the types of events you can receive. With webhooks you can also retrieve information about partner OAuth application events that focus on the disposition of new AffiniPay merchant applications submitted to AffiniPay as part of connecting merchants for white labeled payments. You can poll the list events endpoint to retrieve merchant application events and payment gateway events from a specified start date. Schedule the polling at least monthly. Set a polling window that ensures that you don’t miss any data. The events you receive aren’t batched or sequenced. Anyone can send data to the URL configured for your webhook. Data can be lost if your system doesn’t respond with a 200 OK message before the maximum number of retries. Configuring webhooks depends on which type of event you’re targeting. You can configure AffiniPay Payment Gateway webhooks through the AffiniPay web application or the AffiniPay Payment Gateway API. Scroll to the Webhooks section and specify one or more URLs where you want AffiniPay to send events and press Enter or Return. You can specify different URLs for test- and live-mode transaction events. Changes that aren’t associated with either mode are sent to both sets of URLs. You must configure partner OAuth application webhooks through the AffiniPay web application. The My Partner Applications section on the right lists your partner OAuth applications. 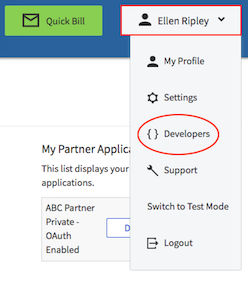 Locate the partner OAuth application you want to configure and click Edit. Specify where you want AffiniPay to send events in the Event URL field.